Declawing Cats: Risky Procedure or Simple Manicure? But a debate on cat declawing has the city’s fur flying, with concern spreading throughout the state of California, the country and even abroad. At immediate issue is a California bill, SB 762, which becomes law on Jan. 1, 2010. The law prevents California cities from restricting procedures performed by veterinarians. As a result, animal rights activists across the state are scrambling to ban cat declawing. San Francisco’s Animal Welfare Commission crafted the city’s proposal to ban cat declawing. Member Sally Stephens says, "It comes down to animal cruelty and mutilating an animal for the convenience of its guardian." Armaiti May, DVM, a veterinarian in Santa Monica, Calif., is supporting a similar proposal in her city. She echoes Stephens’ view. "Declawing is a completely unnecessary procedure," says Dr. May. 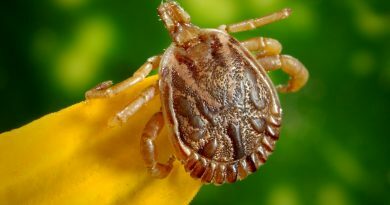 "It causes pain, complications and behavioral problems like litter box aversion." What Exactly Is Cat Declawing? Santa Monica City Council member Kevin McKeown says that cat declawing is a misnomer. "We are not talking about a pampering manicure for cats," he says, explaining that the procedure involves amputation of the last bone in each of the cat’s toes. The Humane Society of the United States (HSUS) supports McKeown’s assessment. A fact sheet concerning declawing that was issued by the society mentions that if the procedure was performed on humans, it would be comparable to cutting off each finger at the last knuckle. At present, there are three primary declawing procedures. Onychectomy: This is the more traditional surgery, involving standard surgical equipment. Most pet hospitals are capable of performing an onychectomy. It is usually the least expensive declawing option. 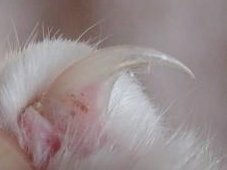 Laser Declawing: According to the HSUS, "a small, intense beam of light cuts through tissue by heating and vaporizing it, meaning there’s less bleeding and a shorter recovery time." But the laser is simply a replacement for a steel scalpel blade, the HSUS adds. Tenectomy: A tenectomy doesn’t remove claws, but it deactivates them by severing the tendons that extend the toes. Since cats cannot properly maintain their claws after the procedure, owners must watch out for ingrown nails and infection. Tenectomy supporters have claimed it results in less pain for cats, but studies suggest otherwise. Sylvie Cloutier, a research assistant professor in the College of Veterinary Medicine at Washington State University and her colleagues examined cats that underwent either of the two procedures. They found no evidence to support the view that tenectomy is less painful than onychectomy. In fact, both cat groups experienced "peak pain" after the surgeries. Many San Francisco residents were surprised when the city’s SPCA did not support the proposed ban on declawing. The SPCA’s position statement says, in part: "Our mission is to save animals’ lives, and we understand that, in some instances, this procedure may be the only way to prevent abandonment, relinquishment or euthanasia." It continues: "We are cognizant of the fact that, unlike the SF/SPCA, a number of animal welfare agencies do not have the resources to address behavioral problems in shelter cats and the cat-owning public, thus making euthanasia an unavoidable option." Unless a cat is suffering from an underlying health condition, such as a cancerous nail bed tumor that would warrant declawing of a paw, my hope is that if you are considering cat declawing, you will seek out what Lindsay Pollard-Post of People for the Ethical Treatment of Animals calls the "many humane and effective ways" to prevent cats from damaging furniture or causing scratches. Buy or construct two or more scratching posts. If your cat has attractive options for maintaining its claws, it should avoid other areas for scratching. Consider purchasing a "scratching box". These are inexpensive boxes, often made of sisal or cardboard, which you place on the ground. My cats love them. Use double-sided tape products. Cats don’t like the sticky feel and will avoid the taped item. 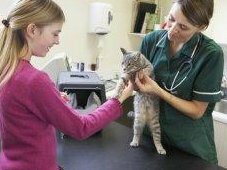 At the end of the day, the decision will still probably rest in yours and your veterinarian’s hands, with your cat’s health at stake. As Jennifer Conrad, DVM, director of the The Paw Project mentions, she has "an obligation to do what is best for the animals, and not what is most convenient for their owners." 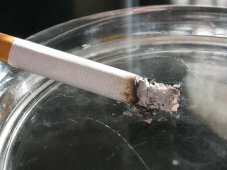 Is Secondhand Smoke Killing Your Cat? Jun 29, 2017 admin Comments Off on Is Secondhand Smoke Killing Your Cat? Probiotics and Prebiotics – Could They Help My Dog? Kennel Cough – What Is It and Should I Vaccinate? © PetPeoplesPlace.com 2019 V8.2 All Rights Reserved. Designated trademarks and brands are the property of their respective owners.